In the horn of Africa, a small native tree, covered in spines, grows in the arid deserts. When the bark is wounded through to the sapwood, the tree exudes an aromatic, oily, yellow oleo gum resin that eventually hardens into a hard yellow-reddish opaque globule that can be easily harvested. The resin has an evocative smell and has been widely used in ceremonies and as medicine. As a result, people have been intentionally wounding and harvesting from the myrrh tree since antiquity. Myrrh has been famously revered by queens, kings, and wise men. Queen Hatshepsut of Egypt reportedly used myrrh as a perfume and in ceremonies and she sent out an expedition around 3500 B.P. to what is now Somalia in search of more myrrh.1 It has long been important in oils used in religious ceremonies and is mentioned in the Jewish, Christian, and Muslim texts. While myrrh has several references in the Old and New Testament, those familiar with the Christian religion will recall it was one of the gifts brought to the birth of Jesus from the wise men. By the 7th Century, myrrh had made its way to East Asia, where it was favored and has remained an important part of the materia medica. Myrrh is a bitter aromatic with warming and drying tendencies. It also moves circulation, dispelling stagnation. 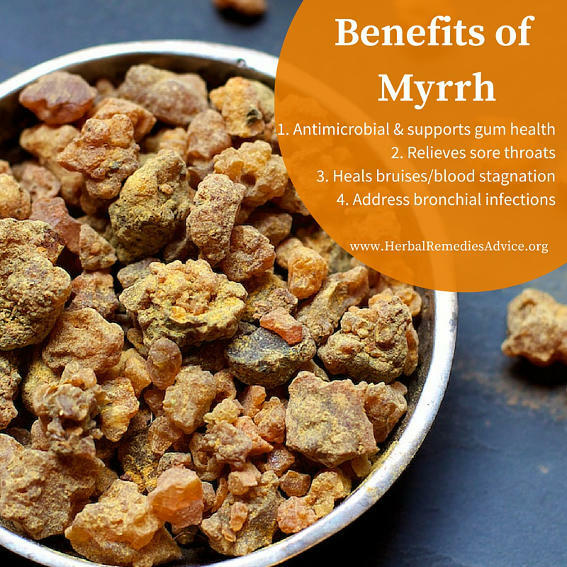 Myrrh gum is indicated by a pale, flabby, damp tongue. This symptom, with heaviness and indigestion, indicates relaxation of the gastrointestinal tract, with mucus in the stool; relaxation of the respiratory mucosa with phlegm in the lungs; a full congested feeling in the pelvis and clear vaginal discharge, reproductive relaxation, and so forth. 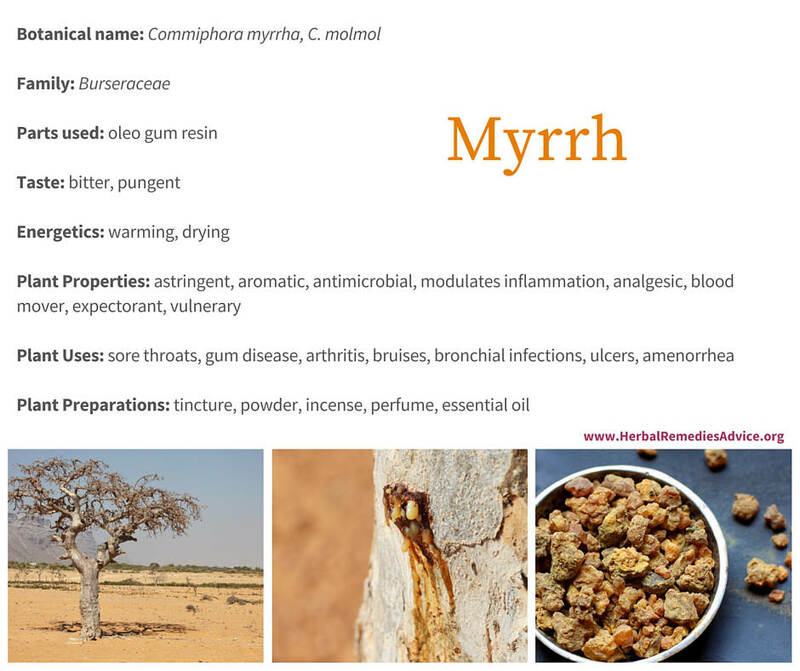 Other wounds that can benefit from myrrh’s healing qualities are boils, pimples, herpes outbreaks, and abrasions. Myrrh helps wounds to heal in several ways: it is antimicrobial, which can eliminate infection. It is also astringent, which helps to tighten and tone tissues, helping them to heal. It can also increase circulation to an area, thus helping your own body to bring important healing hormones and immune system cells to the area. Many texts recommend the use of this beautiful-smelling resin on wounds that look putrid and smell foul. In Traditional Chinese Medicine, myrrh is primarily seen as an herb that moves blood (circulation). It can move blood stagnation such as bruising or pelvic congestion and is commonly used in external preparations for bruising, contusions, arthritis, and other painful conditions. It is an ingredient in Kloss’ Liniment, a well-known preparation developed by Jethro Kloss, author of Back to Eden (1939). Kloss’ Liniment is recommended for sore muscles, bug bites, and boils. Myrrh has also long been recommended for a variety of pulmonary problems, including bronchitis and asthma. 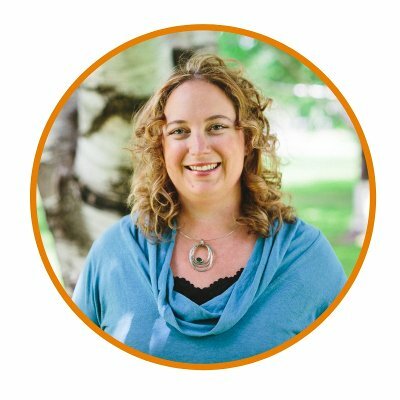 As always, keeping in mind myrrh’s energetics helps us to match it to the right symptoms. Weak lungs, difficulty expelling mucus, pale mucous membranes, and congestion are all signs indicating that myrrh would be helpful. 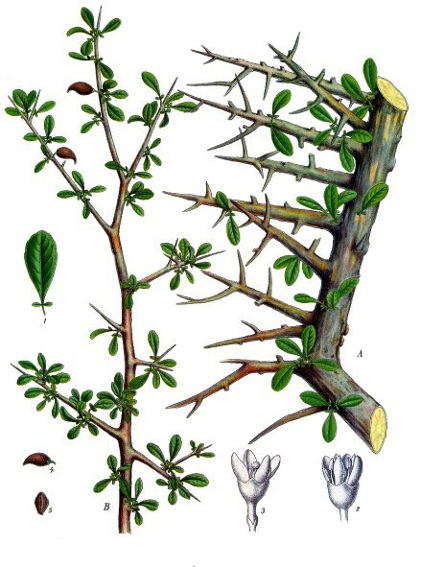 There are two species of Commiphora that are used interchangeably: Commiphora myrrha and C. molmol. 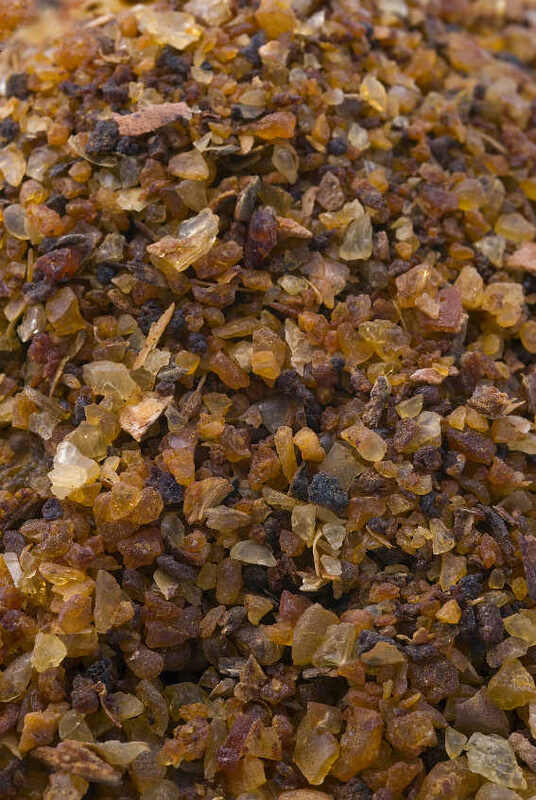 Myrrh is high in resins, making it best prepared as an alcohol extract (tincture: 1:5, 95% alcohol) or as a powder. External liniments (alcohol extractions) can also be used. Myrrh does not work well as a tea because the resins are not soluble in water. For internal use, dosages should remain small; otherwise adverse effects such as gastric irritation may occur from the powerful resins. May cause digestive upset in sensitive individuals or in high dosages. May cause contact dermatitis (rare). Commiphora myrrha grows to about 13 feet (4m) and has many spines. It likes thin soils (preferably with limestone) and a desert climate. It can grow at an altitude of between 820 to 4,270 feet (250 to 1,300 m). While the native range of myrrh trees is fairly small, all major systems of herbalism have adopted its use into their traditional medicine. While the Western world most appreciates it for its ability to heal wounds and address mouth health, Traditional Chinese Medicine uses it most to move blood. Even though these different systems have different uses, the fact that this oleo gum resin has infiltrated so many systems of medicine far beyond its native habitat says a lot about the respect people have for myrrh. You can buy a variety of Myrrh preparations at Mountain Rose Herbs. Duke, James A. CRC Handbook of Medicinal Spices. Boca Raton, FL: CRC Press, 2003. 131. Wood, Matthew. The Earthwise Herbal: A Complete Guide to Old World Medicinal Plants. Berkeley, Calif.: North Atlantic Books, 2008. 205. Osbaldeston, Tess Anne, trans. De Materia Medica: Being an Herbal with Many Other Medicinal Materials : Written in Greek in the First Century of the Common Era : A New Indexed Version in Modern English. Johannesburg: IBIDIS, 2000. Mansour, Ghada, Soliman Ouda, Ahmed Shaker, and Hossam M Abdallah. "Clinical Efficacy of New Aloe Vera- and Myrrh-based Oral Mucoadhesive Gels in the Management of Minor Recurrent Aphthous Stomatitis: A Randomized, Double-blind, Vehicle-controlled Study." Journal of oral pathology & medicine : official publication of the International Association of Oral Pathologists and the American Academy of Oral Pathology 43, no. 6 (2014): doi:10.1111/jop.12130. Langhorst, J, I Varnhagen, S B Schneider, U Albrecht, A Rueffer, R Stange, A Michalsen, and G J Dobos. "Randomised Clinical Trial: A Herbal Preparation of Myrrh, Chamomile and Coffee Charcoal Compared with Mesalazine in Maintaining Remission in Ulcerative Colitis--a Double-blind, Double-dummy Study." Alimentary pharmacology & therapeutics 38, no. 5 (2013): doi:10.1111/apt.12397. Bensky, Dan, Andrew Gamble, and Erich Stöger, comps. Chinese Herbal Medicine: Materia Medica. 3rd ed. Seattle, Washington: Eastland Press, 1993. 637. Abo-Madyan, Ahmed A, Tosson A Morsy, and Saad M Motawea. "Efficacy of Myrrh in the Treatment of Schistosomiasis (haematobium and Mansoni) in Ezbet El-Bakly, Tamyia Center, El-Fayoum Governorate, Egypt." Journal of the Egyptian Society of Parasitology 34, no. 2 (2004): 423-46. Felter, Harvey Wickes. The Eclectic Materia Medica, Pharmacology and Therapeutics,. Cincinnati, O.: J.K. Scudder, 1922. Mars, Brigitte. 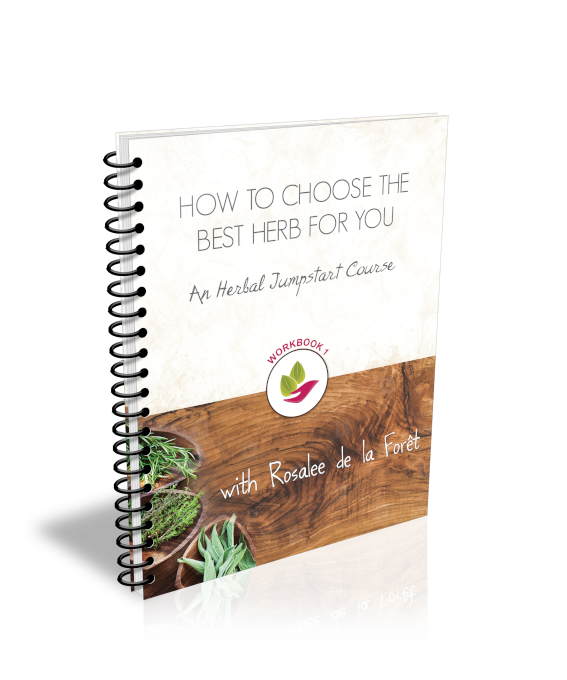 The Desktop Guide to Herbal Medicine: The Ultimate Multidisciplinary Reference to the Amazing Realm of Healing Plants, in a Quick-study, One-stop Guide. Laguna Beach, CA: Basic Health Pub., 2007. 210. Khalsa, Karta Purkh Singh, and Michael Tierra. The Way of Ayurvedic Herbs: The Most Complete Guide to Natural Healing and Health with Traditional Ayurvedic Herbalism. Twin Lakes, Wis.: Lotus, 2008. 161. Hoffmann, David. Medical Herbalism: The Science and Practice of Herbal Medicine. Rochester, Vt.: Healing Arts Press, 2003. 541.